Nearly three years removed from the worst financial crisis since the Great Depression, the investing public has grown increasingly frustrated with the lack of criminal prosecutions and insufficient penalties levied against the senior executives and companies responsible for igniting the subprime meltdown. Revelations of greed and mismanagement related to the meltdown continue to emerge almost daily. The failure of regulatory agencies such as the SEC and Department of Justice to hold individuals accountable, despite significant evidence that intentional misconduct by U.S. corporations caused the financial crisis, has subjected those agencies to intense criticism. It has fallen to investors to fill the vacuum left by those regulators, by enforcing the securities laws through civil litigation. This process is critically important to ensure the integrity of the market, make certain that shareholders are adequately compensated for their losses, and send a strong message that fraudulent conduct will not be tolerated. However, the obstacles litigants face in deterring and punishing corporate fraud have increased in recent years. Please join our panel of experts as they discuss the challenges of holding corporate America accountable, the limits of regulatory, criminal and private enforcement, and why the "small fish fry and the big fish wiggle off the hook." 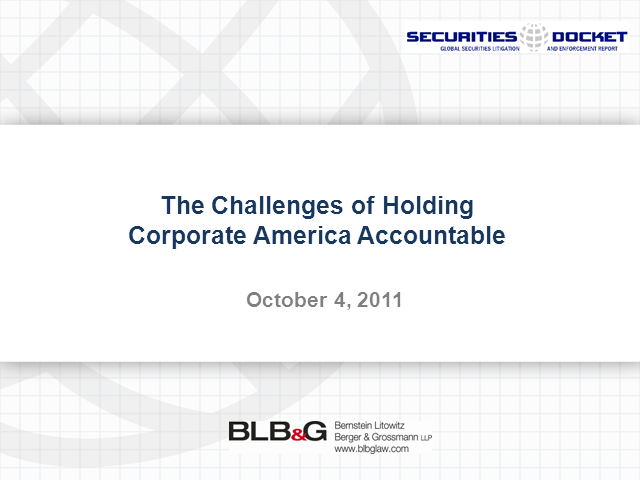 --BLB&G partner Chad Johnson as moderator. The financial services industry generates and records massive amounts of transactional, operational, and other business data on a daily basis. Yet, the challenge financial institutions face is how best to leverage myriad data sources to effectively mitigate business and regulatory risk. On March 25, Securities Docket presents a panel of industry and data analytics experts to help brokers, dealers, financial services leaders and their counsel turn data into valuable insights to spot and prevent fraud. Join Joshua Dennis, StoneTurn; Ellen Lafferty, HSBC; and Dan Ward, Ropes & Gray for this thought-provoking panel moderated by A.J. Bosco. Participants will gain an actionable understanding of how data analytics can be used to uncover useful information, suggest conclusions and support sound decision-making in the financial services industry. • developments in ICO’s; cyber-related matters; financial reporting; remedies and sanctions; and the Whistleblower Program. Please join panelists Bill McLucas from Wilmer Cutler Pickering Hale and Dorr LLP; Doug Davison from Linklaters; and Marty Wilczynski and Steve Richards from Ankura Consulting as they address these and other key developments in SEC enforcement. 2018 was a watershed year in the securities litigation marketplace. In addition to the record number of newly-filed cases, there was significant growth in the dollar value of settlements, both in the U.S. and across the world. During calendar year 2018, 441 new cases were filed in U.S. federal courts, plus dozens more in state courts and in countries such as Australia, Canada, Denmark, Germany, Netherlands, and the United Kingdom. The value of settlements included significant sums in the U.S., including Petrobras ($3 billion) and Wells Fargo ($480 million), plus more than a dozen non-U.S. settlements led by Ageas (f/k/a Fortis - €1.3 billion). As we enter the new year, 2019 will likely see similarly robust activity. Already, dozens of newly filed cases are in the court system and the amount of pending litigation is substantial, with a total of more than $1 trillion in Investor Losses (NERA’s measure of case size). Additionally, a few noteworthy settlements were finalized in early 2019, including Wal-Mart ($160 million) and Cobalt International ($146 million). This webinar will be valuable to all financial and legal professionals practicing in this area. Attendees will benefit from ISS and NERA's timely insights into the complex and rapidly-growing securities litigation environment. 2018 was a record-breaking year for the SEC’s Office of the Whistleblower. The Office announced the largest whistleblower award, received the highest number of whistleblower tips, and awarded more dollars in 2018 than in all prior years combined. Meanwhile, in Digital Realty Trust v. Somers, the Supreme Court limited the definition of “whistleblower” under Dodd-Frank to a person who has reported a suspected securities violation to the SEC. In response, the SEC has proposed amendments to Rule 21F-2, along with other proposed changes to the claim review process and the award determination process. These trends and changes provide the perfect storm for keeping in-house counsel and compliance professionals up at night. Securities Docket is pleased to present its seventh annual webcast on Dodd-Frank’s whistleblower provisions. This year’s panelists once again include leading practitioners in all aspects of Dodd-Frank whistleblower litigation and investigations, including F. Joseph Warin and John W.F. Chesley of Gibson Dunn, former SEC Office of the Whistleblower Chief Sean X. McKessy of Phillips & Cohen, and Jim Barratt of Ankura Consulting. This free 90-minute webcast will include a dynamic and participatory discussion on the statutory and regulatory framework of Dodd-Frank’s whistleblower provisions, their interpretation by the SEC Office of the Whistleblower and federal courts, and provide participants with practical tips for navigating the minefield of whistleblower complaints. This webinar will examine the regulatory and enforcement landscape facing crypto-asset investment managers amidst surging ICO and STO issuance and a sharply increased scrutiny by the SEC of crypto issuers and their token offerings, as well as broker-dealers and digital asset managers. Our expert panel will address regulatory and compliance issues that crypto funds often encounter, including SEC registration, requirements for qualified custody, valuation of crypto assets for reporting purposes, and fiduciary due diligence best practices. The panel will also provide guidance on recent SEC enforcement actions against crypto asset managers and discuss expectations of the future SEC stance with respect to crypto funds. -- Does the Investment Advisers Act of 1940 apply to crypto funds, including SEC registration obligations and compliance with the Custody Rule? -- What is the current state of digital asset custody and what are the future developments in the qualified institutional custody solutions for cryptocurrencies? -- How should the manager of a crypto fund value its assets, including for the purposes of handling redemptions? -- What are the current independent third party valuation advisor approaches for valuing digital tokens? -- How can the manager of a crypto fund satisfy its fiduciary obligations with respect to diligence of digital assets and counterparties involved? -- Based on the recent empirical evidence with regard to ICOs and the performance of exchange-traded digital tokens, what are the key due diligence parameters that a crypto fund manager should assess? --What recent SEC enforcement actions with respect to crypto asset managers have we seen and what approach in the future is the SEC likely to take towards crypto funds in terms of examination and enforcement? What cyber-related actions should corporate boards be undertaking and more importantly, what should corporate secretaries, general counsels, outside lawyers and other corporate advisors be telling their corporate board clients regarding cyber? This webcast offers, for the first time, a realistic, concrete, pragmatic, detailed, sensible and effective vision for corporate board behavior, designed to tackle head-on the mounting and potentially devastating risks that flow from cyber-attacks and other data security incidents. With cyber-incidents capturing headlines around the world with increasing frequency, businesses and regulators have come to recognize that cyber-incidents are not a passing trend, but rather in our digitally connected economy, an embedded risk that is here to stay. Our panel will address issues including how cybersecurity risk has clearly elevated itself to the top of corporate agendas; the implications of the SEC’s 2018 Statement on Cybersecurity Interpretive Guidance as it relates to the duties and responsibilities of corporate boards and corporate officers; why corporate directors must now must consider themselves “on notice” when it comes to cybersecurity; and why corporate boards must now take tangible steps to translate their high-level concerns around cybersecurity risks into specific behaviors and precise actions that are identifiable, capable of being readily implemented and heavily documented. Please join John Reed Stark, former Chief of the SEC’s Office of Internet Enforcement, now President of John Reed Stark Consulting LLC and David R. Fontaine, former CEO of Kroll, now Senior Advisor to Duff and Phelps (following Kroll’s acquisition by Duff and Phelps), for this timely and relevant webcast. This webcast will cover issues that lawyers often encounter in commercial litigation with reviewing and understanding financial statements. Our panel of accounting experts will cover fundamental accounting concepts and components that are the basis of the financial statement reporting- the statement of financial position (balance sheet), the statement of profit and loss (income statement) and the cash flow statement. Our panel will also show how to derive meaningful conclusions about the performance of a business through financial ratio analysis and trend analysis. In addition to understanding and analyzing financial statements, the webcast will highlight recent changes in generally accepted accounting principles that will affect the presentation of information contained in the financial statements. Please join Jeff Litvak, CPA/ABV/CFF, ASA and Jason Tolmaire, CPA/ABV, both of FTI Consulting’s Forensic & Litigation segment, as they address these issues as well as your questions. The Americanisation of the SFO! 7 years after the entry into force of the Bribery Act, this webcast will look at how far the UK has come. Our panel of expert UK attorneys and consultants will look back over the last 12 months and forecast where we see developments in the year to come. --What next with new Director Lisa Osofsky? --House of Lords review into the Bribery Act – what are they looking at and will anything change? --Privilege: With the ENRC appeal about to be heard and a couple of new cases in the last 6 months, what is the position right now? Are witness notes protected, or not? Please join Barry Vitou, Shareholder and Head of London White Collar Defence and Special Investigations, Greenberg Traurig; Julian Glass, Senior Managing Director, Forensic & Litigation Consulting, FTI Consulting; Vivian Robinson, Partner, McGuire Woods; and Richard Kovalevsky QC - 2 Bedford Row for this free webcast in which we'll address these issues and your questions. The crypto-financing landscape, still barely in its infancy, is caught up in the perfect storm. Initial coin offerings (ICOs), a term meant to describe the offer and sale of digital assets issued and distributed on a blockchain, as well as crypto-trading platforms, where ICO tokens and coins trade like common stock, are under greater scrutiny than ever before – and with good reason. •The Internal Revenue Service has announced its intention to make sure all crypto-associated taxable events are fully paid and properly recorded. This webcast explores, in plain English, the various U.S. statutes, rules and regulations which apply to the crypto-marketplace – and how the application of both old and new laws should ultimately shut down all ICOs and crypto-trading platforms involving U.S. investors. Discussion during this one-hour session will focus primarily on the extensive catalogue of applicable SEC and AML regulations. As a follow-up to our April 4th, 2018 webinar ("Anti-Money Laundering Regulation of Digital Assets"), Alma Angotti, Managing Director and Global Investigations & Compliance Practice Co-Leader and Gino Soave, Director at Navigant; and Martine Beamon and Jai Massari, Partners at Davis Polk & Wardwell LLP will examine the impact of the federal securities laws on digital assets. This webcast analyzes the first 48 hours following a cybersecurity incident, and lays out incident response strategies that facilitate critical decision making and enable victim companies to rapidly recover. Having evolved significantly over the past several years, cyber incident response has moved beyond just quantifying the data exposure and hunting for end-point threats. New techniques such as user behaviour analytics and cloud identity management are two examples of game changers in modern incident response. Traditional hard drive forensics were historically the primary source of evidence during a cyber investigation and are now just one component of the effort where broader crisis management, threat pursuit, and information assurances take on prominent roles in the response. Join Ankura’s senior cybersecurity experts as they share their respective decades of experience in leading organizations through some of the most complex incident response engagements. Learn valuable insights into new approaches in IR that are imperative in today’s initial response in the First 48 hours of a significant cybersecurity incident. --What are the primary risks and efforts that the most elite incident responders are concerned about in the First 48 hours of a significant security incident? --What are the key questions inside and outside counsel are asking cybersecurity experts in the First 48 hours of a significant security incident? --What are some of the new and emergent approaches to cyber IR to better providing better assurances to the victim organization? --Where are some organizations missing opportunities for greater assurances during the response in the First 48? · A practical discussion of the potential impact of Lucia on SEC administrative proceedings, whether pending or already adjudicated. Please join Britt Whitesell Biles and Meryl D. Grenadier from Stein Mitchell Cipollone Beato & Missner LLP as they discuss this important Supreme Court case and its potential impact on SEC administrative proceedings. Ms. Biles recently joined Stein Mitchell from the SEC, where she served as Assistant Chief Litigation Counsel in the Division of Enforcement. At the SEC, Ms. Biles investigated and litigated securities enforcement actions, including administrative proceedings. In 2017, Ms. Biles received the SEC Chairman’s Award for Excellence for leading the litigation in the SEC’s groundbreaking law firm hacking case in which Chinese nationals were charged with securities fraud for trading on the basis of material nonpublic information that was stolen from law firms when their networks were hacked. Within recent months, U.S. and international regulators have been moving swiftly to regulate cryptocurrency in various ways. On February 13, 2018, the U.S. Department of Treasury Financial Crimes Enforcement Network (FinCEN), in a letter to Senator Ron Wyden, Ranking Member on the Senate Finance Committee, reiterated its position that cryptocurrency exchanges are required to register as Money Service Businesses (MSB). The requirement to register as an MSB triggers the obligation to develop, document an anti-money laundering (AML) and sanctions compliance program. In a panel discussion, Alma Angotti, Managing Director and Global Investigations & Compliance Practice Co-Leader at Navigant; Gino Soave, a Director in Navigant’s Global Investigations & Compliance Practice; Claiborne (Clay) Porter, Managing Director and Head of Investigations at Navigant; and Jason Somensatto, Of Counsel at Orrick discuss the practical effects of FinCEN’s position and how companies in this industry can ensure that they don’t run afoul of AML and sanctions regulation and enforcement. The first quarterly reporting deadline for public companies is quickly approaching, and that reporting for the first time will include significant disclosures related to the newly-implemented accounting standards. By January 2018, companies were expected to update revenue recognition rules for all revenue arising from contracts with customers, which requires not only a change to financial statements, but related disclosures, business processes and internal controls over financial reporting. In a panel discussion, Cathy Connolly of StoneTurn and Jonathan Shapiro of Baker Botts will focus on the changes brought about by the new rules, and address the questions they raise. -- What types of issues may be brought to light? From what sources (internal, SEC, other)? -- How does a company and its counsel respond? -- What is the board’s response? -- How can the key problems be quickly identified, and an effective response, including a remediation plan, be implemented? Sapin II, the new French anti-corruption law, has been in effect for nearly a year now. The new law required companies with operations in France to implement compliance programs, created a new French anti-bribery agency, and created a judicial agreement similar in structure to the U.S. deferred prosecution agreement (“DPA”). In a panel discussion, Xavier Oustalniol of StoneTurn, Daniel Kadar of Reed Smith and Dominique Laymand of Ipsen will provide an update on how these changes in French law are impacting companies and whistleblowers. -- How are Affected Companies Handling the New Compliance Rules? • developments in the Whistleblower Program, the new Cyber Unit and Retail Strategy Task Force, and other ongoing initiatives. Please join panelists Bill McLucas from Wilmer Cutler Pickering Hale and Dorr LLP; Doug Davison from Linklaters; and Marty Wilczynski and Steve Richards from Ankura Consulting as they address these and other developments in SEC enforcement. In the midst of reported declines in securities enforcement, 2017 was yet another record year for reports to the SEC’s Office of the Whistleblower. In the six-year history of Dodd-Frank’s whistleblower provisions, the SEC has turned tens of thousands of tips into nearly a billion dollars in enforcement actions, returning over $160 million of the pockets of whistleblowers. In 2017, the SEC continued to financially reward those who come forward with information concerning potential securities violations as well as take aggressive enforcement actions against those alleged to have discouraged whistleblowing through retaliation or restrictive severance agreements. On top of all this, the federal courts continue to teem with civil anti-retaliation claims and the Supreme Court has agreed to decide the foundational question of whether Dodd-Frank’s anti-retaliation provisions apply to those who have not reported to the SEC. These trends, coupled with dynamic developments in FCPA enforcement, provide the perfect storm for keeping in-house counsel and compliance professionals up at night. Securities Docket is pleased to present its sixth annual webcast on the intersection of Dodd-Frank’s whistleblower provisions and the FCPA. This free 90-minute webcast will include a dynamic and participatory discussion on the statutory and regulatory framework of Dodd-Frank’s whistleblower provisions, discuss their interpretation by the SEC Office of the Whistleblower and federal courts, analyze their intersection with the FCPA, and provide participants with practical tips for navigating the minefield of whistleblower complaints. Internal investigations have become a much higher-stakes issue for companies of all sizes. The SEC filed a record high number of enforcement actions in 2016. In recent years, the U.S. Department of Justice has expanded its interest in internal investigations from the “what” and “why” to also include an emphasis on “how” companies conduct them. Now, the two agencies are more actively coordinating on investigations involving accounting fraud and FCPA issues. In a panel discussion, Rex Homme of StoneTurn and Catherine Moreno of Wilson Sonsini will focus on the impact of heightened scrutiny on corporate compliance programs, best practices for responding to government inquiries and how to avoid enforcement actions. The rapid growth of so-called “unicorn” companies – privately held start-ups with valuations of more than $1 billion – presents a number of significant regulatory challenges and risks. Although many people believe that special rules and exemptions apply to unicorns, in fact, unicorns may not be so unique in the eyes of regulators. Much like public companies, it is more important than ever that they focus on developing appropriate legal and compliance procedures surrounding capital raising, public disclosures, options compensation, and related issues to avoid, or best respond to, scrutiny by regulators, including the U.S. Securities and Exchange Commission (SEC). · Transitioning from Private to Public: What Happens Next? The recent Equifax data breach is perhaps the largest in history and has barraged the company and its senior executives with a complex and challenging range of legal, financial and technological issues -- issues that every corporation and its outside counsel will inevitably (and unfortunately) encounter. In this timely webcast, John Reed Stark, seasoned data response professional and former Chief of the SEC's Office of Internet Enforcement, drills down to explain it all. Don't miss this early opportunity for a detailed analysis, presented in plain English, of the many critical caveats, reminders and takeaways from this evolving and ironic cybersecurity incident. Timely webcasts, analysis, updates and presentations about securities litigation, SEC enforcement and white collar issues. This channel allows listeners to learn about cutting-edge issues from the leading attorneys, consultants, and other professionals in the securities litigation industry.